The wide tracks of Soviet T-34S and colossal KV-1S crunched through the snow. Night had fallen west of Belgorod on March 15, 1943. The Soviet tank col- umn was headed toward a village, looking for shelter for the night. Although the village appeared deserted, the Soviet commander was wary. For days now there had been heavy fighting, with the Nazis trying to recapture Kharkov from the Soviets. The T-34s fired incendiary shells, set- ting ablaze a few peasant huts. When nothing moved, the tanks rumbled into the village. The commander’s tank came to halt, unaware that the muzzle of a Tiger tank hidden in a barn was pointed straight at him. Flames shot out of the barn and an 88mm shell smashed into the command tank. Suddenly, the whole village erupted in cannon fire from hidden panzers. Every- where Soviet tanks were bursting into flames. Panic gripped the Soviet tankers, for they had rec- ognized the hand of enemy commander, Graf Strachwitz, the “Panzer Count,” whose exploits on the Russian front would make him a legend in World War II. The young Strachwitz grew up on the agricultural and forest estates of his family, who were among the richest land owners in Silesia. Strachwitz attended the Volksschule and the Gymna- sium of Oppeln. He began his cadet training at the Royal Prussian Junior Cadet School in Wahlstatt and then transferred to the renowned Central Cadet School at Berlin-Lichterfelde. Strachwitz had no problems with academics, excelled at sports and at horse riding, and was a superb fencer. Strachwitz’s regiment was part of the 1st Guards Cavalry Division and Generaloberst Karl von Bulow’s 2nd Army. Bulow was attacking through Belgium and headed toward the Marne. Carrying out reconnaissance, Strachwitz impressed both his men and his superiors. Even the latter addressed him as Herr Graf, as Strachwitz preferred. Because of his daring, the soldiers nick- named Strachwitz the “Last Horseman.” Soon Strachwitz was awarded the Iron Cross 2nd Class and recommended for the Iron Cross 1st Class. Strachwitz’s capture in October 1914 was the beginning of a long ordeal fraught with hardship. Because they had been caught in civilian clothing, the French regarded them as spies and saboteurs. Twice it looked like Strachwitz and his men would face the firing squad, but their sentence was five years at hard labor. At Avignon, Strachwitz underwent a year of torture and humiliation. Regain- ing his soldier’s status, Strachwitz was transferred to the German officer prison at Fort Barre. Strachwitz tried to escape by digging a tunnel but was caught. As punishment, he was chained up in the hold of a French ship to deter U-boat attacks. Strachwitz was emaciated by the time hewas returned to Fort Barre. As soon as he recovered, Strachwitz joined Oberleutnant von Lossow in another escape attempt. The two climbed the wall, threw a guard off the parapet, and jumped down the other side. Strachwitz landed in barbed wire and tore his foot, but he and Lossow were free. During the Battle of Annaberg in the Silesian Uprisings Strachwitz outfought the Poles facing him, forcing their surrender after a short but bloody fight. In March 1921 Upper Silesia voted whether to remain in Germany or be ceded to Poland. Although the German vote won, the region that voted Polish was allowed to join Poland. Unsatisfied, militant Poles led by Wojciech Korfanty tried to seize the German territory as well. At Gross Stein, Strachwitz awoke to gun shots and the sound of refugees fleeing from the advancing Poles. Strachwitz brought his family, including his pregnant wife, to safety then hurried back to join the German resistance. Strachwitz handled logistics for part of Heinz Guderian’s XIX Corps during the Battle of France in 1940. He also participated in the fighting and earned the Iron Cross Second Class. On the morning of May 14, French aircraft struck the German crossing of the Meuse Bridge. Strachwitz directed traffic and ordered the men to take cover. After the German break through over the Meuse, Strachwitz set out with his Kubelwagen and driver for a reconnaissance. Nineteen miles into French territory, they pulled up to a French signals garrison. Strachwitz got out of the car, calmly lit a cigarette, and demanded the surrender of the garrison in perfect French. He told the captain that his panzers were only minutes away. The bluff worked and 600 French soldiers surrendered. Strachwitz delivered the captives in their own new trucks. “Strachwitz, that devil” said General Friedrich Kirchner of the 1st Panzer Division upon learning of the feat. Promoted to major, Strachwitz was awarded the Iron Cross 1st Class in June. Strachwitz drove back attacking tank packs, chased them into the night, and shot up Soviet batteries while fighting with Army Group South during Operation Barbarossa. 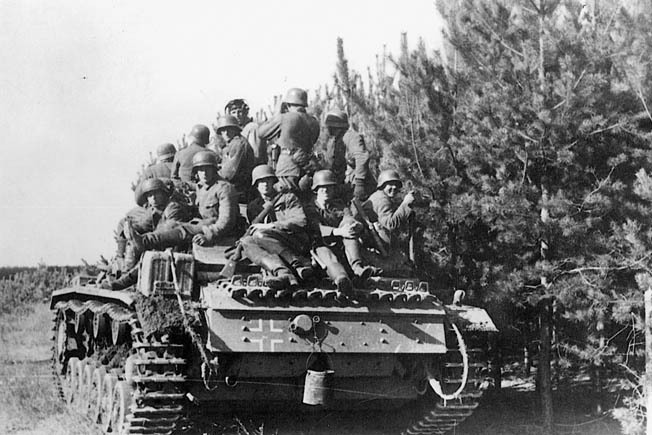 erman panzergrenadiers hitch a ride on a panzer. 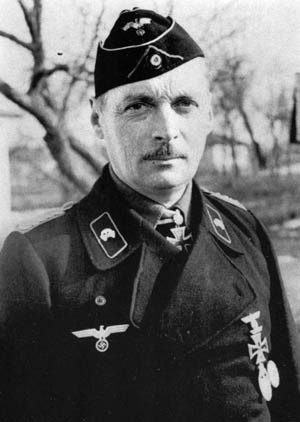 In early 1943 Strachwitz commanded the panzer regiment of the elite Grossdeutschland Division and played a key role in the German victory in the Third Battle of Kharkov. A brief period of rest followed the German victory at Izyum. Around this time Strachwitz took over command of the entire regiment, which from June 10 onward took part in the preliminary battles for Case Blue, the massive German summer offensive of 1942. Through drenching rainstorms and seas of mud, Strachwitz engaged more Soviet armor and fought off night attacks. 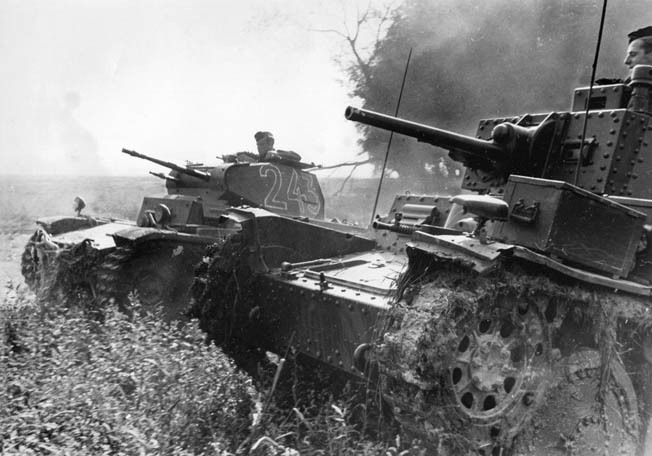 The 16th Panzer Division cap- tured the heavily fortified city of Kupjansk in mid-June. During the fighting, a shell splinter struck Strachwitz’s head. He had the wound provisionally treated, then quickly returned to his men. On July 8, once more rested and refitted, 16th Panzer Division took part in Sixth Army’s drive for Stalingrad on the Volga River. Assault- ing the Soviet bridgehead over the Don River west of Kalach in late July, Sixth Army won its last great encirclement battle. Armor combat raged through the villages and on the heat- scorched grass steppes, mirrored by equally fierce aerial engagements in the sky above. Strachwitz was again wounded. His regiment breached one of the last Soviet defenses north of Kalach, enabling the linkup with 24th Panzer Division. During the battle, Strachwitz’s regiment claimed 270 enemy tanks destroyed. 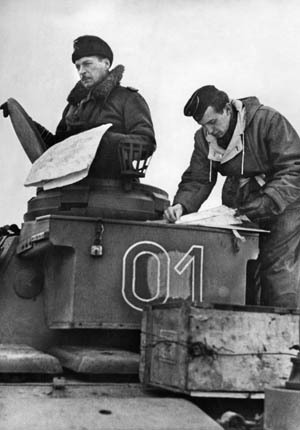 Strachwitz in the cupola of a panzer. Strachwitz was awarded the Swords to his Knight’s Cross on March 28. His soldiers hon- ored him by substituting Strachwitz’s name for that of the Napoleonic-era Lutzow in the popular soldier’s song “Lutzow’s Wild, Venturous Hunt.” Strachwitz took two weeks of hol- iday visiting Berchtesgaden with his wife Alda. Appearing on a radio show, Strachwitz accredited his successes to the close cooperation, the high skill level, and the total commitment of every single man in his regiment. Strachwitz returned to combat in August. 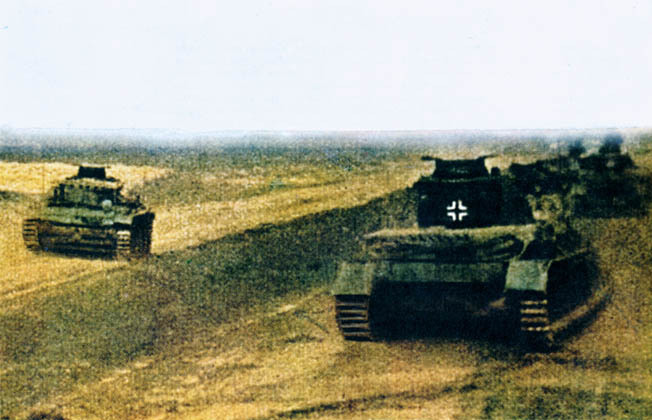 The Battle of Kursk had meanwhile ended in a Ger- man defeat, forcing the German Army to withdraw ever farther westward. So severe was the fighting that Strachwitz only had one operational panzer by the end of September. By late December, Grossdeutschland was across the Dnieper River at Kirovgrad. Strachwitz received another serious wound, this time in the left arm. After being sent to Breslau hospital, he completed his con- valescence at home. On March 26, Strachwitz attacked head-on as swampy wooded terrain precluded any out- flanking. Spearheading the attack in one of the first three Panzer IVs, Strachwitz was nearly hit by friendly fire from a Stuka. The fighting continued through the night in dark, claustrophobic conditions. Walking stick in hand, wearing his trademark sheepskin jacket, Strachwitz was always at the front, keeping up on the latest battle developments and insuring sufficient supplies. He handed out cognac and chocolate, offered encouragement, and awarded Iron Crosses. It took several days of hard fighting until the Soviets were defeated. 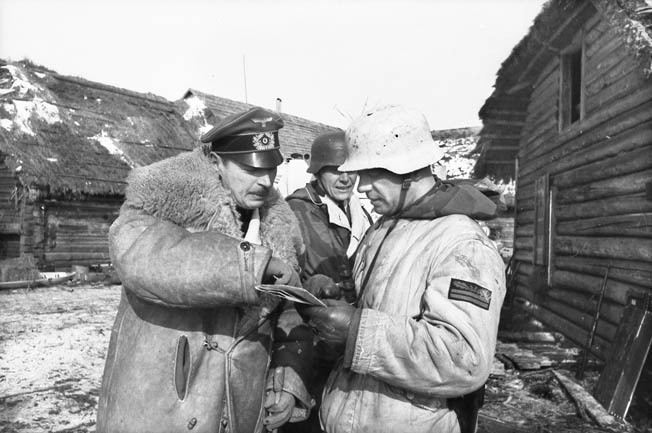 In 1944 Strachwitz, left, joined Army Group North where he led panzer forces in a fierce counterattack to eliminate the expansive Soviet bridgehead over the Narva River at Krivasso. In recognition of Strachwitz’s initial successes, Hitler presented him with the Diamonds to the Knight’s Cross. Strachwitz bluntly rejected Hitler’s request to eliminate the remain- ing bridgehead. “Panzers can’t drive in the swamp,” Strachwitz told Hitler. Strachwitz continued to lead infiltrating actions on the southern flank of Army Group North. Penetrating 90 miles into enemy territory, Strachwitz burst upon an unsuspecting Soviet tank lager, blowing up tank after tank and spraying their startled crews with machine-gun fire. 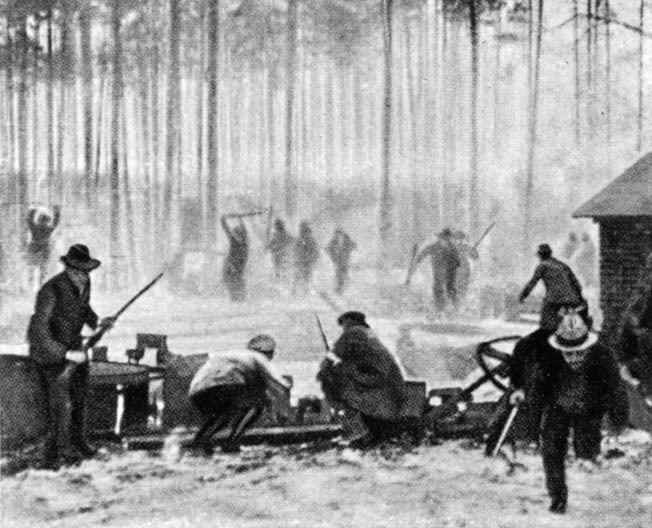 On August 18, Strachwitz’s battle group advanced from of Frauenburg, East Prussia, crossing Lithuania on its way to Tuckum. Strachwitz’s command consisted of about 2,500 Waffen-SS and Wehrmacht soldiers and 60 panzers, mostly new Panthers from Panzer Brigade 101. There were also a couple of Tigers from the 103rd SS Heavy Panzer Battalion, Mark IIIs and IVs of SS Brigade Gross, and armored personnel carriers and flak units. At a bridge west of Tuckum, the surprised Soviet battalion gave up without a fight. Reaching the outskirts of the city on August 20, Stra- chwitz called for support from the cruiser Prinz Eugen in the Gulf of Riga. Prinz Eugen’s 203mm guns and the guns of several destroyers zeroed in on Tuckum’s market square, obliterating dozens of parked T-34s. 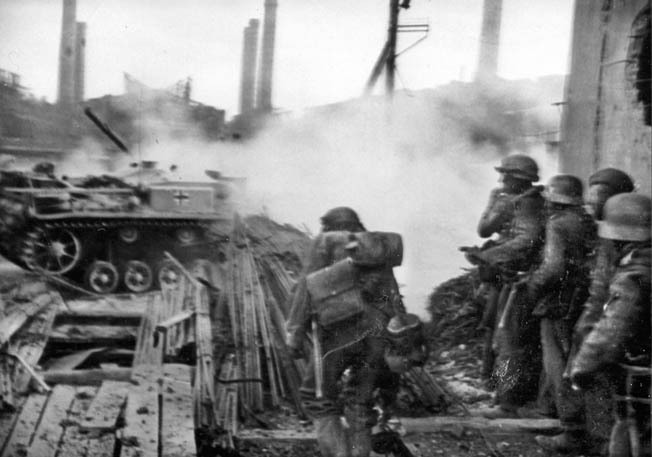 Strachwitz’s panzer entered the city, driving by charred tanks. Some were overturned and their crews dead and burned. As for the survivors, they were too dazed to fight back. A few remaining tanks were easily dispatched. With SS Brigade Gross holding Tuckum, Strachwitz intercepted an approaching Soviet convoy. Believing themselves surrounded, the whole convoy surrendered. After Germany’s surrender on May 8, Strachwitz ensured that most of his soldiers ended up in American captivity. A still limping Strachwitz surrendered to an American lieutenant in Felgen. The count looked so haggard that the lieutenant thought he needed medical help. Taken to the Allendorf, Strachwitz found himself in the company of several hundred German officers, includ- ing Guderian and Adolf Galland. They were treated well and used to gain records of the war and military tactics. Strachwitz spent two years in captivity, during which he received the disheartening news that his wife Alda had been killed by a U.S. military truck. Strachwitz continued to work near miracles at the battlefront with ever shrinking panzer forces in mid-1944. He led panzer forces in fierce fighting in East Prussia and the Baltic States, temporarily delaying vastly larger Russian forces. Upon regaining his freedom in the spring of 1947, Strachwitz no longer had a home to which he could return. His ancestral lands in Upper Silesia had been occupied by Russians who later handed them over to Poland. His tattered uniform and his medals were all that Strachwitz had left. In a fresh start to a new life, Strachwitz married again. His bride was the much younger Nora von Stumm. After two years abroad beginning in 1949, the couple eventually returned to Ger- many, settling in upper Bavaria. Strachwitz founded a refugee foundation for displaced Silesians and became a Knight of Devotion of the Order of St. John. Tags Adolf Galland, American, antitank gun, Ardennes, army, artillery, assassin, Austria, axe, Bagration, Battle of France, Battle of Kursk, Belgium, Berchtesgaden, Berlin, Black Sea, British, British Expeditionary Force, broadcast, Camouflage, cannon, cavalry, cavalry saber, Chasseurs, CIA, Company B, Crest, Destroyers, Dunkirk, English Channel, Erich von Manstein, Europe, Flak, France, French, general, general heinz guderian, Generaloberst, Geneva, German, German Cavalry, German Sixth Army, Germany, Gestapo, grenadier, Guderian, hitler, Horsemanship, iron cross, Izyum, Kharkov, Kiev, kirovograd, knights, Kubelwagen, Latvia, lithuania, Mark I, Mark III, mark Iris, Mark IV, Marne, Meuse, military, Militia, napoleon, narva, Nazi, Nazi Party, NSA, Operation Bagration, Operation Barbarossa, Operation Citadel, OSS, Panzer, Panzer Army, Panzer Corps, Panzerfaust, Paramilitary, Paris, PC, Pola, Poland, POW, Prinz Eugen, Prussia, radio, riga, Rittmeister, river, Rostov, Russia, Russian Front, saber, SAS, Soviet Union, soviets, spear, Squad, ss brigade gross, Stalin, Stalingrad, strachwitz, sword, swords, Tank Corps, Tanks, Tern, The Division, Third Reich, Tiger Tank, Tory, Troy, tuckum, U-Boat, Ukraine, Union, us military, VA hospital, volga river, Waffen-SS, waves, wehrmacht, wehrmacht soldier, wehrmacht soldiers, West Bank, WIN, World War I, wounded, Yugoslavia, Zero.